With every new iOS release there is an inclination to assume that fewer iPhone, iPad and iPod Touch owners will be interested in a new jailbreak--and every year the jailbreak community proves that theory wrong. Will evad3rs jailbreak iOS 7.x before we see a jailbreak for 6.1.4? With every new iOS release there is an inclination to assume that fewer iPhone, iPad and iPod Touch owners will be interested in a new jailbreak. However, we/I am proved wrong year after year. Sure Apple adds new functionality to every major iOS update, often drawing upon (stealing?) tweaks and apps introduced by the very talented developers in the jailbreak community. But there is always that next big thing, that one tweak or jailbreak app you just can’t live without that Apple never addresses. Last year the iOS 6.x jailbreak was the most anticipated jailbreak ever. Millions of iOS owners with unmatched pent-up demand for the newest jailbrake were finally rewarded for their patience. This year, however, there is hope that we won’t have to wait 5 months to see Cydia running on our home-screen. 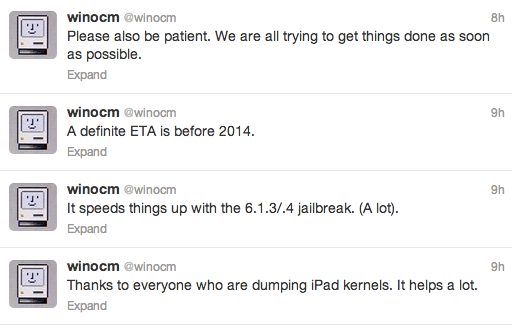 Recently, we have heard more and more from @winocm about his progress on a jailbreak for 6.1.3/4. Earlier today he took to Twitter again sharing his thoughts on an ETA for his jailbreak. He gives a “definite” ETA of “before 2014.” While this might seem far away in the grand scheme of things, I think he is most likely working himself in some breathing room–the jailbreak faithful can be brutally persistent when they smell blood in the water. Perhaps he hopes that by extending his timeline he will have less pressure on him from the community, and more privacy to complete his work. With all this talk of a jailbreak for iOS 6.1.x most of the spotlight has been off iOS 7.x–which is to be expected. iOS 7 is still has that new OS smell on it–why even think about tinkering with it? Indeed. Build it and they will come, though. Release a new firmware, and the community craves/demands to have their cake and eat it too. So, when/if we can expect a jailbreak for iOS 7, and exactly who might take the lead on such a project. If I had to guess who the front-runners would be, I would have put my money on @evad3rs. They tackled iOS 6.x and provided one of, if not the most stable and reliable jailbreaks I have ever used. You can imagine the excitement throughout the jailbreak community when @planetbeing Tweeted that they were indeed at it again. Less than a month later, @planetbeing continues to tweet more good news– evad3rs was working on a jailbreak for iOS 7, and they may have all the necessary “pieces” for an iOS 7 jailbreak. However, he cautioned that at this point they’re not completely certain. Only time will tell I guess. This is fantastic news, as @evad3rs was the mastermind behind the evasi0n jailbreak of iOS 6.x, released to the public the day after the Super Bowl in early February of this year. These guys (@pimskeks @planetbeing @pod2g @MuscleNerd) definitely are the “dream team” of the jailbreak community right now, and I am confident that they will have a jailbroken version of iOS 7 available for public download in the very near future. This begs the question then–do you care? Are you excited about a jailbreak for your iOS device? 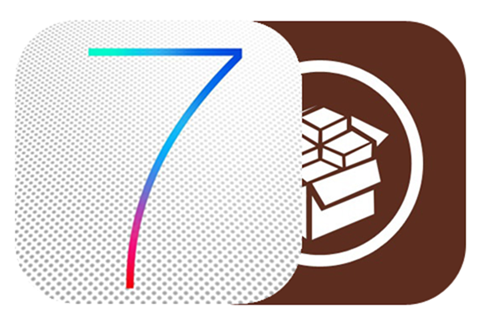 Do you plan on staying on iOS 6.1.x if there is a jailbreak released for iOS 7? Please chime in and let us know your plans in the poll below, and in the comment section below that. *jailbreak. You’re spelling it wrong.